For Weidemann, quality is not an empty word, but rather a daily living reality that is "Made in Germany". For a true Weidemann comes from one of the most modern wheel and telehandler production facilities in Europe. The newly inaugurated plant in 2007 in Korbach in northern Hesse guarantees a consistently high quality of our products. This results in safety, comfort and economic efficiency that you can always count on. Quality begins very early at Weidemann, because the adherence to defined work processes is taken seriously. The in-house quality assurance team controls the purchased parts that are supplied to the Weidemann production. This takes place for new parts as well as for series production parts. The supplied parts are regularly compared with the 3D CAD data of the design here. If an error should be discovered on the part during the examination, a corresponding report, including photos for traceability purposes, is sent directly to the supplier for correction. The powder-coating represents one of the key features of the special quality standard at Weidemann. A spinner blasting system was installed before the painting system so that we can guarantee the best possible basis for an optimal, long-lasting paint finish. Even large assemblies with complex geometries can thus be optimally prepared for powder-coating or painting. Why do we afford two different painting procedures? The high quality surface treatment is of course the powder-coating. About 80% of our parts are powder coated. However, with this method an object temperature of 180°C must be achieved for at least 10 minutes. Only in this way can we obtain the best possible cross-linking of the powder with the component – which ultimately makes for enormous durability! Due to the large heat effect, we cannot powder coat all parts: Weidemann paints about 20% of the parts in the wet painting process. This is the case with modules that are already filled with oil or have soft seals, such as shafts and cylinders and those parts that would not withstand the heat effect. In contrast to conventional wet painting, powder-coating greatly increases the service life of the machines and is therefore the more production method. Powder-coating is also very environmentally-friendly, since we work with a recovery of the starting materials in the system. Every Weidemann that leaves our factory was subjected to a careful final inspection. This guarantees a high level of durability and reliability, a high level of operating and repair friendliness and low operating costs right from the start. 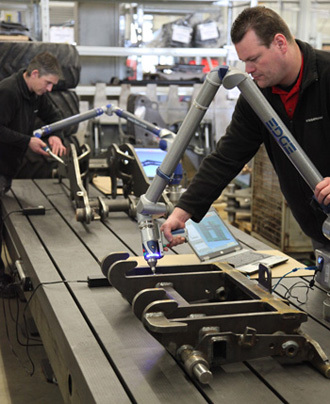 Using a defined checklist, all machines run through an extensive final inspection. The filling volumes are checked, the engines are properly adjusted and any detected deficiencies are remedied. Then the vehicles drive onto the outdoor test track, where all essential functions are used again and then checked: the speed of the machine, the different hydraulic pressures, the braking deceleration readings, the pendulum stops of the link and the optimum engine speed. All measures are recorded in a final report so that it is always evident who made the "final acceptance" of this machine. Following the final acceptance, the ready signal of the machine is announced to the order management via electronic data processing. At the same time, all machine documents, such as the device chart, production checklist, manufacturing accompanying list and acceptance minutes of the "machine CV file" are added so that it is evident at all times which components have been installed in the respective machine. Expertise and commitment to quality is sought after at all levels of employees. In this way, human qualities can go hand in hand with the process quality. Productivity, delivery reliability and product quality are rewarded through innovative incentive schemes in the production plants. This increases our employees' awareness of quality, performance and satisfaction similarly, which benefits our customers. You see: As a premium provider, Weidemann places the highest value on a high quality standard. Every Weidemann employee works hard to achieve this every day.